The RAF has ended its involvement in Iraq, after 19 years of operations that began with the 1990 Gulf War. From today, most British air personnel remaining in the country will return to the UK. 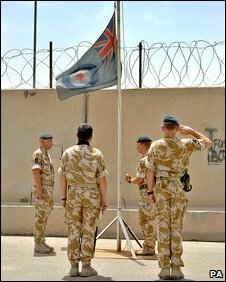 The RAF Ensign - flown at Basra Airport in southern Iraq since 2003 - has been lowered at a ceremony for 903 Expeditionary Air Wing. A total of 22 RAF personnel died in Operation Telic, the name given to the UK military mission in Iraq since 2003. The RAF was deployed on operations in the Gulf in August 1990, when Saddam Hussein invaded Kuwait. It enforced the northern and southern zones for 12 years before playing a key role in the invasion of Iraq and the subsequent six-year British military mission. Combat operations officially drew to a close at the end of April, with UK Prime Minister Gordon Brown hailing their "success story". On Friday, Wing Commander Ian Richardson, officer commanding 903 EAW, took the salute as the ensign was lowered. Basra airfield had officially been handed over to Iraqi control in January as part of moves to wind down Britain's commitments in the country. Chief of the Air Staff, Air Chief Marshal Sir Glenn Torpy, said: "The RAF can be justifiably proud of what it has achieved over many years in Iraq and I would like to express my sincere thanks to all the personnel who have been involved in the various phases of this long campaign."